A 15 minute journey of about 7 km from the town of Kyrenia will lead you to a beautiful and relaxing vacation terminal namely Bare Hill Holiday Village. The location and set up of Bare Hill makes it very special and attractive in terms of nature. 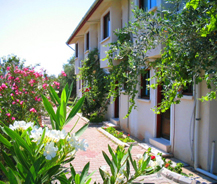 It is surrounded by authentic Cypriot flora. Numerous local buses run from Kyrenia to Bare Hill regularly. A 2 minute walk from Bare Hill will head you to the village of Alsancak, where you can witness the genuine Cypriot flavor. The hotel rooms are furnished with Mediterranean culture. Rooms are equipped with all the facilities to comfort guests up to utmost degree. Our swimming pool will surely renovate you energy level. You will be amazed by the astonishing panorama of the Kyrenia Mountains and the mystifying blue Mediterranean Sea. A 5 minute walk will direct you to the shining sandy beach. Beach provides you with all the necessities of scuba diving and many water sports. Bare Hill offers a prodigious worth of your money. Bare Hill will stand out to be your perfect holiday destination. Bare Hill welcomes you with motto and promise of showing you the amazing spectacle of nature in the vicinity of Mediterranean Sea from BARE perspective.